I want to take a moment and thank everyone who reads this blog. I started this blog over 2.5 years ago and really didn’t know where it would end up (I still don’t). 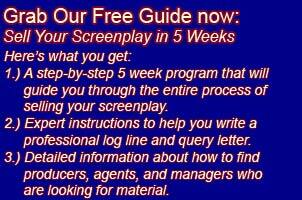 I really have enjoyed helping people try and sell their screenplays and I hope that I can continue to do so. So to everyone who reads this blog thank you. As the blog has grown I’ve also started to get inundated with emails and phone calls from people with questions. I try and answer every single email that comes in. It’s been very rewarding and I’ve meet some interesting people through these emails. Hopefully I’ve helped a few people, too. But please do NOT call me. I guess my phone number is easier to track down than I would like because I’ve been getting a lot of phone calls recently. I simply do not have the time or inclination to answer phone calls or call people back so please, if you have a question email me. But before you email me do a search using the search box on this blog. In a lot of cases the question you have might have already been answered. If you can’t find an answer to the question feel free to email me and I will get back to you with an answer, assuming I know the answer, as soon as I can. The single largest request I’ve been getting recently is from people who want me to write, rewrite or polish their screenplay or idea. They usually offer to split the profits once the script is sold. I’m getting probably a half dozen of these requests per week. The ideas range in quality but most of the ideas have been good solid ideas and have potential. But here’s the thing, as a writer myself I’ve got more than enough of my own ideas I want to write. Over the years that I’ve been a screenwriter people have pitched me literally hundreds of ideas, and while a lot of them have been really good, I’ve never been the least bit interested in writing their ideas for them for a cut of the potential profits. Again, I have a lot of my own story ideas and a very finite amount of time to write them in. If I’m going to work on spec I’m going to write my own ideas. For me part of the enjoyment of being a screenwriter is working on ideas that are personal to me. I’m sure most people feel the same way. Now if you have a budget and you are looking for a screenwriter to rewrite or write your idea that’s another matter entirely. If there is a legitimate budget to pay a screenwriter I’m happy to discuss your project with you. I am, after all, a professional writer, that’s what I do. Turn this around for a moment. Suppose someone came up to you out of the blue and pitched you a good solid idea for a screenplay and wanted you to write it for them but they only were going to pay you if and when the screenplay was sold. Would you do it? I doubt you would. Your time is precious and I’m sure you have lots of your own ideas you want to work on. Also, please read this post as it might be helpful if you’re looking to find someone to write your screenplay up: How to hire a screenwriter to write your life story or great movie idea. If you’re looking for a script consultant to give you notes on your screenplay please see this post: Script Consultants. Ultimately I’ve tried to make this blog about empowering writers and trying to give them the tools, advice, and guidance to sell their own screenplays. So if you want to try and sell your screenplay please read this post: How to Sell Your Screenplay (in a nutshell). And of course you can always email me at: info@sellingyourscreenplay.com. Next post: Will an established writer get credit for my screenplay? Previous post: Should you try and make your screenplay on a low budget?